Short lived variation of the Nuovo / Super Record derailleur first seen in Catalog 17a supplement, in late 1978. 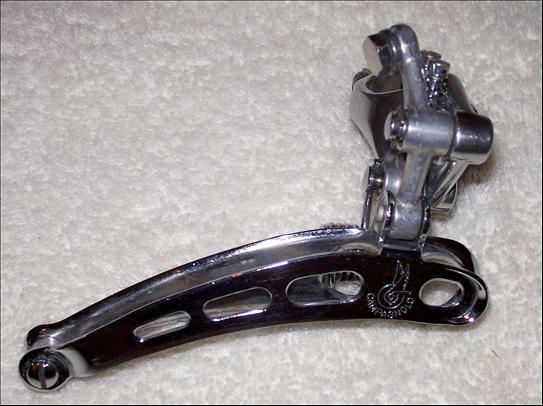 Derailleur was later revised to have 3 holes instead of 4, and went back to the more traditional style front clamp band. The narrow clamp was reported to be weak and prone to breakage. Likewise the additional 4th hole was prone to snagging on chain pins and causing damage to the derailleur. The 4-hole version was available overseas in late 1977 as a 1978 production piece, and went out of production at the end of 1978 with the introduction of the 3-hole version. This derailleur was displayed in the 1979 Campagnolo-USA Catalogue Supplement 17A, as part #0104007 (see URL: http://www.campyonly.com/history/catalogs.html). This was, I believe, the last year of the large "winged wheel" logo. Apparently, there are some overlapping 3-hole 1978 narrow clamp versions with the large logo on the outside plate, but when the SR black anodized 3-hole was introduced, the logo size was reduced.